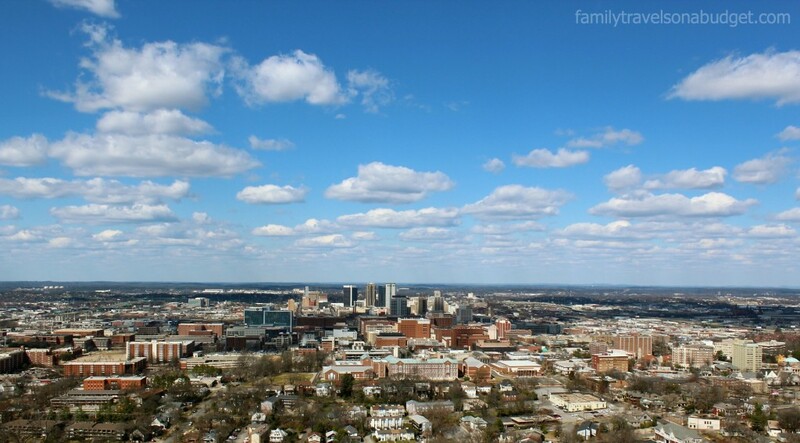 From the vantage point at the top of Red Mountain, visitors to Vulcan Park and Museum can see the city of Birmingham which sits in the valley below. 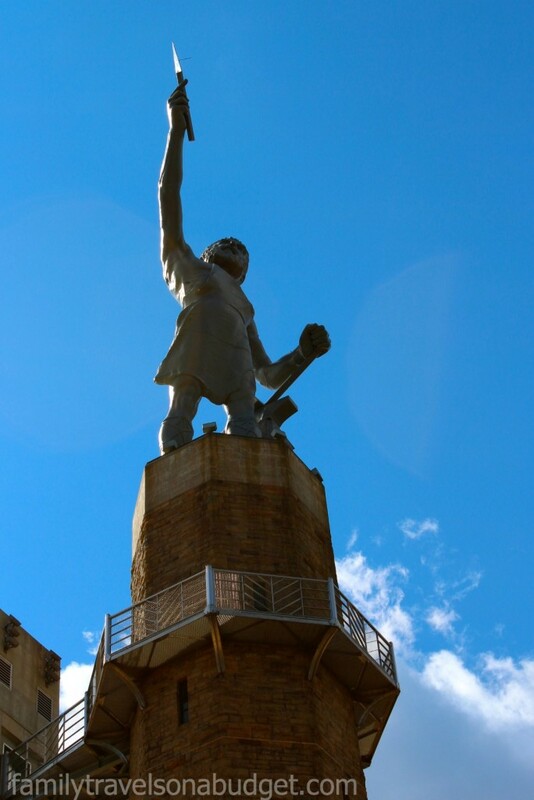 Vulcan is the largest cast iron statue in the world, standing at 56 feet tall. It portrays the Roman god Vulcan, god of fire and forge, standing with his arm raised high. The Vulcan statue has become the city symbol of Birmingham, reflecting its founding as the iron and steel capital of the south. 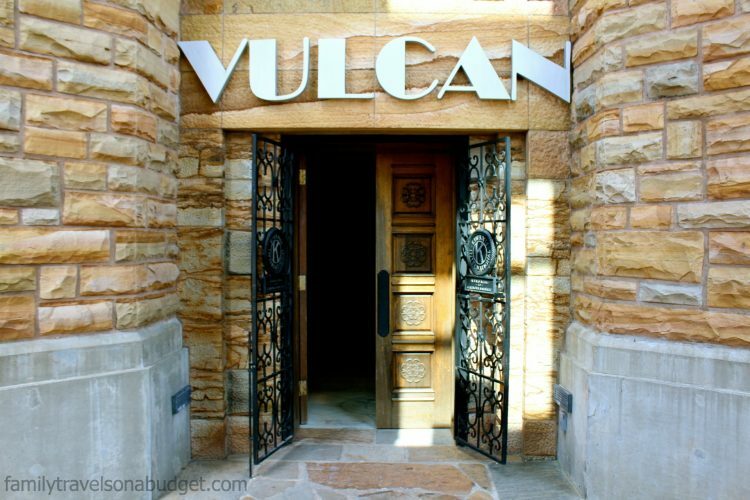 Vulcan originally was created for the 1904 World’s Fair in St. Louis. Other cities offered to purchase the statue, but Birmingham kept it and settled it permanently on Red Mountain in the 1930s. In the 1990s, civic leaders funded a major overhaul to preserve Vulcan. They also created an educational museum to share Birmingham’s history. The first exhibits illustrate Birmingham’s early history as a “company town,” focused on industry. Then visitors get an up close look at the Vulcan statue’s creation, history, and restoration as well as the industry that brought the “Magic City” to life. 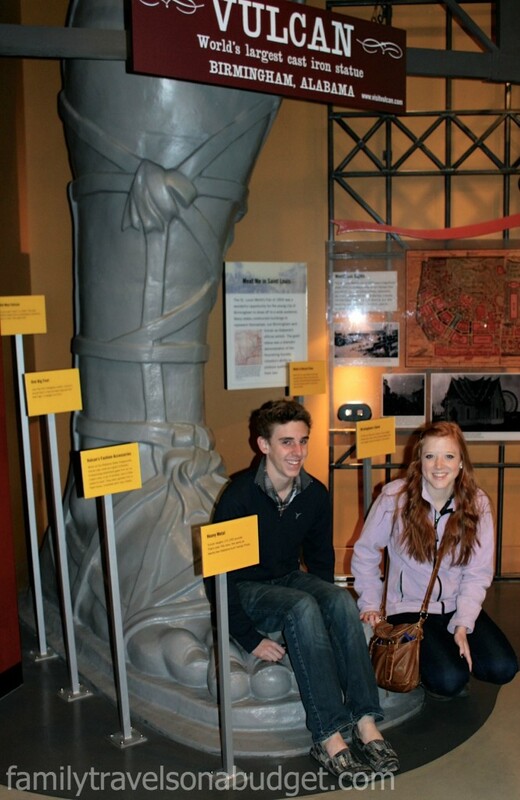 My son (5’10”) takes a seat on this full-scale replica of Vulcan’s foot. The museum takes guests through Birmingham’s economic collapse during the Depression and the civil unrest of the 1960s. The “Birmingham Today” exhibit shares the city’s rebirth in new areas of business: banking, medical research and education. 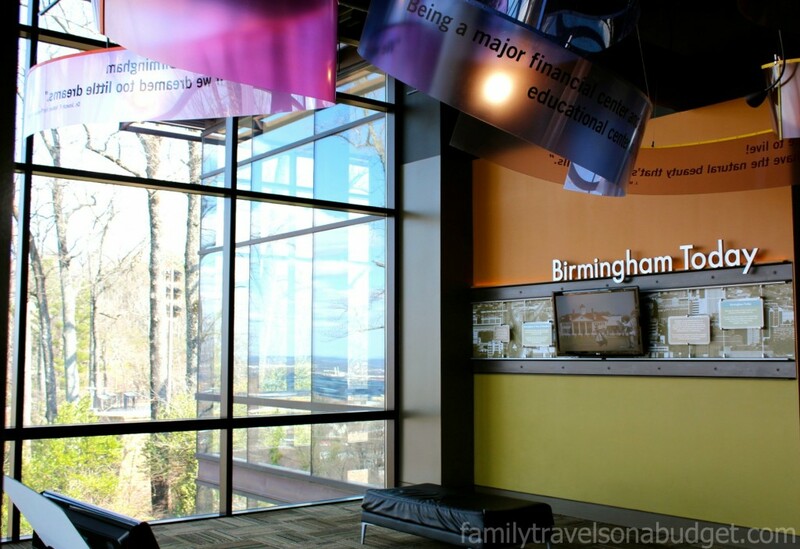 Walls of windows offer guests a great (wind-free) view of Birmingham today. To plan your visit to Vulcan, visit the park’s website. In addition to regular hours, the park is open every evening from 6-10 p.m. for great views of the city lights. I recommend you allow 2-3 hours to visit, about a half hour to climb the tower and look at the views and the rest to tour the museum. Pack a picnic lunch and enjoy the vista while you’re at it! If you can’t get to Birmingham, check out museums and statues in your area. Contact your local Convention and Visitor Bureau (CVB) to discover local secrets. Who knows? You might just find something new to love about your hometown! Special thanks to the Birmingham CVB and the Vulcan Park and Museum staff for arranging my visit. I look forward to returning this spring when trees and flowers have bloomed and the winter winds are long gone! I also wondered if this would be a Star Trek statue. Even though it’s not, it looks like a fun family visit. I’ve yet to visit Alabama. What an interesting museum! I had no idea that Vulcan was the Roman god of fire and forge either – I don’t think I’ve ever heard the word apart from the Star Trek connection. Love the view! Okay, I’ll admit it. I thought there was a statue of Spock somewhere in Birmingham. Good to know who vulcan actually is. This was most insightful as to the city history. Unfortunately, when I think of Birmingham, I think civil rights movement. It’s nice to be reminded there are other things to remember Birmingham for. Seeing your son sitting on the life size foot replica, brought home how tall the statue really is. Being a Star Trek fan, the first thought that went through my mind when I saw the headline was of the character played by Mr. Spock. Television culture has taken hold of my brain! 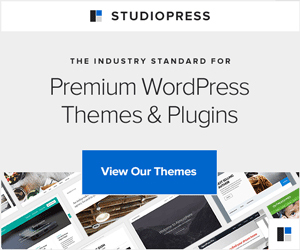 Thanks for this post and the reminder of Roman mythology.